My fingers are just a bit numb, but I finally finished the binding of the Tribute to Tonie quilt. I paced myself and did one and a half sides each day. As I was binding this quilt, I kept asking myself why I made it so large. The whole idea for the quilt began in January 1, 2017. I had purchased the book, Block a Day, by Lucinda Ganderton, and my plan was to make a block a day. As I studied the blocks, I found blocks that represented things and memories of my mother. I knew that February would be the year anniversary of my mother’s passing , and mom was very much on my mind. So, I just started making the blocks, without a real plan. Nothing unusual for me, not to plan ahead. The quilt will fit on my bed, or maybe I can hang it in the living room. After looking at this quilt for quite some time, there is nothing I would have done differently. The quilt just tells the story of my mother, so I am very happy with it. My friend, Jeana Kubik, did an excellent job with the long arm. I had to do some major rearrangement in my sewing room in order to facilitate adding the sleeve to the back of the quilt. I still have to add the label. It is difficult getting a good picture of this, since I cannot hang it up just yet. The center of the quilt is mom’s pink and brown house…yes, pink and brown. We often referred to mom as 215, the house address. These are two of my favorite blocks. The cup represents our Sunday morning coffee visits. It does feel good to get this done. Now, I will take a break for a few days, before I start binding the third quilt. I decided to chill for these few remaining days before my trip. Since my work table has turned into my packing-for -vacation table, I really can’t work on any projects. The next best thing is to design NEW projects! Abbie, from Sparkle On! 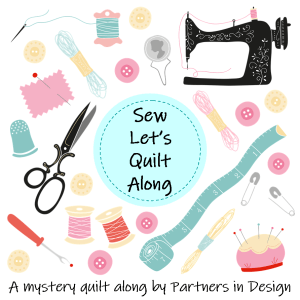 with Abbie posted an invitation to join a Christmas QAL. I have never done a mystery quilt,and I am still considering doing this. One of the perks, besides the fun in working with this group of creative people, would be the chance to learn/practice some different techniques. Abbie did get me thinking ahead on seasonal projects. I am usually a last-minute type of person. During this self-imposed hiatus from working on projects, I decided to design an autumn quilt. Autumn is my favorite season, even though in my area of Texas, autumn is a bit different. I remember dragging books about fall, and setting up scarecrows, baskets of leaves, pumpkins, and other autumn goodies to my classroom for the children to experience autumn. The room was turned into an Autumn Festival, even though the outside temperature was still 90 degrees and above. As I was saying, before I bird-walked off topic, I do love autumn. I’ve been wanting to make an autumn quilt for some time. Some shops already have gorgeous fabric that just shout, “Autumn!”. These are some of my quick design sketches. This is already larger than I want, so I would adjust this to something more like a lap throw. The second border would be made of multi-color nine patch blocks. The leaves would be made of different autumn colored fabric on beige, with a gold-ish border. I would cut the block in a wonky fashion and set the blocks in different directions as part of a tumbling leaves design. The four corners would probably be paper pieced blocks of an owl, a squirrel, an acorn, and maybe a field mouse or pumpkin. I found these free paper pieced patterns on Craftsy. This is more of a Halloween background so I would change that up a bit. I found these squirrel blocks on Sew Fresh Quilts . These are definitely beyond my skills, but I just thought they were great blocks. These are just preliminary thoughts on a quilt I might or might not make. I just enjoy fooling around with designs. Oh, by the way, my Brack Pack friends and I are taking a road trip to Crystal Bridges in November. We should see some beautiful autumn foilage. As usual, I got side-tracked and started looking through Lucinda Ganderton’s book, Block a Day. It is the Bird Block, block #77. It was fun playing around with this block. I have two sketches using this block in two different directions. There are still a couple of more days of waiting and preparing for my trip, so I have time to play with some more designs. Oh, and aren’t these cute? I found these luggage tags and thought they would be just right for our trip. The purple and blue stripes are for my granddaughter. If this post seems to be “all over the place”, it is because I am “all over the place”…more so than usual! I officially declare today to be a Pajama Day. 1. The time change messed me up. 4. I finished two large quilt tops yesterday. Note: I do wear earrings and comb my hair on PJ Day, so I am spruced up a bit. After finishing the border on the Hope quilt yesterday, my original plan was to wait until today to finish the Tribute quilt. I took a reading break, and then decided to finish the Tribute quilt. It felt so good to get this done. Lot’s of stories and memories with each of the blocks. The quilt is so big, it was difficult to take a good photo. The border is the same pink fabric that was used to frame the house block in the center of the quilt. Thanks again, to Lucinda Ganderton. Her book, Block a Day, was the inspiration to tell my mom’s story. This is my first time to make a quilt with so many different types of blocks. The book provided great instructions for cutting and piecing the blocks. The time change has thrown me a bit off, but I managed to complete the top of the Hope quilt. The keyboard strips were an accurate fit for the borders. It works out in that the quilt was a self-challenge to use up scraps. I’m also surprised that my plan-as-you go method worked out better than I thought. This is the best picture I could take. “I know that it’s wet and the sun is not sunny, but we can have lots of good fun that is funny.” Dr. Seuss. Another rainy day, and I loved it. Got a lot done on the Hope quilt. The vertical sashes were a bit difficult for me. I had to rip the sashes a few times because the corners did not match. My sister suggested I use teal for the sash, and I’m glad I listened to her. Tomorrow, I will add the keyboard border. Thanks to Lucinda Ganderton and her book, Block a Day. This makes two quilts, and two tote bags that I have made using the blocks from her book. My son uses a design program when he is planning a piece of furniture he will be building. He asked if there were any quilting design programs, and that was the first I ever thought of something like this. After a bit of researching, I found a free program, Pattern Jam . I also found an app for the iPad, Quiltology. I tried the free program today, and I am still learning how to use it effectively. One glitch that I ran across was in designing the border. The border for my Hope quilt is not solid. It is made of keyboard strips. I was not able to find out how to insert the different keyboard strips. The result was a border showing just one keyboard strip. I will keep playing with this and see if it is worth using. One benefit I can see already, is the ability to layout the design and color scheme. This is the result of the Hope quilt on Pattern Jam. Tonight, I will be attending my first guild meeting. The Alamo Heritage guild meets at a church that is near my house. This will give me the opportunity to ask people about quilt design programs. Lucinda Ganderton, the author of Block a Day, commented on my blog! I was so happy to read what she had to say. Her book has been a great resource for me. My granddaughter says that Sunday is her favorite day. I agree with her totally! It is my favorite day. The quote is from freshmorningquotes. After going out for a Sunday breakfast, I returned and got busy finishing the blocks for the Hope quilt. I may not make the quilt just yet, but I feel good that the blocks are completed. This is the first design layout, without the sashes. I don’t know what color would be best for sashes. Any ideas on this are welcomed.